The next EuroCIS, the leading trade fair for retail technology in Europe is just around the corner! 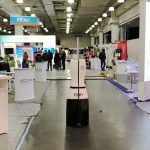 We present our inventory robot TORY as innovation for the retail industry within the start-up hub area of ​​the fair. Just drop by and get advice!